Michy Batshuayi-Atunga is a Belgian professional footballer who plays as a striker for the club Valencia, on loan from Chelsea. He was born on 2nd October 1993 in Brussels, Belgium. The right-footed player won the Ebony Shoe Award in the 2013-14 season and UNFP Player of the Month in October 2015. Batshuayi had a nomadic youth career with spells starting with Evere in 2003, Schaarbeek, Brussels, Anderlecht and Brussels again before he joined Standard Liègein 2008. He had 6 different spells at 8 years of youth career. After 3 years at Standard Liège’s youth system, he was promoted to the first team in 2011. On 20th February 2011, Batshuayi made his debut in the Belgian Pro League for Standard Liège in a 4–1 loss away to Gent, where he came on for Franck Berrier for the last seven minutes. On 15th December 2011, Batshuayi scored his first professional goal in an away encounter to FC Copenhagen in the last match of Group B during the 2011–12 UEFA Europa League group stage, sending his team into the knockout stages. On 28 March 2015, Batshuayi made his international debut for Belgium in a UEFA Euro 2016 qualifying match against Cyprus. Coming in the 77th minute, he scored from outside the penalty area in the 80th minute to lead them to a 5–0 victory at home. On 21st November 2011, he scored both the goals in a 2–1 win at Lierse in the quarter-final first leg of the Belgian Cup. He got his first league goal on 14th January 2012 to finish off a 6–1 home win over Germinal Beerschot. In the 2013–14 season, Batshuayi netted 21 goals in 34 games, putting him just behind Lokeren's Hamdi Harbaoui for the league's top scorer who had scored 22 goals. On 8th August 2014, Batshuayi was signed by French outfit Marseille for a reported £4.5 million. On 29th October he scored his first goal for the club in a 2–1 defeat at Rennes in the third round of the Coupe de la Ligue. Premier League Club Crystal Palace’s bid was accepted by the club but Batshuayi did not want to make the move, instead engaging with a £33.2 million offer from Chelsea. On 12th May 2017, Batshuayi came on as a second-half substitute against West Bromwich Albion and scored a goal on 82nd minute when he slotted a goal past Ben Foster, to win Chelsea their fifth Premier League title. 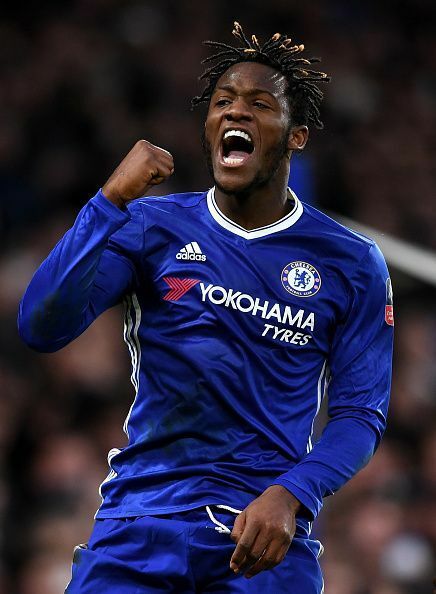 On 20th September 2017, Batshuayi scored his first Chelsea hat-trick in a 5–1 home win against Nottingham Forest in the third round of the EFL Cup. On 31st January 2018, Batshuayi joined Bundesliga club Borussia Dortmund on loan for the rest of the 2017–18 season. His debut came on 2nd February away to Cologne, where he scored twice and made an assist. The match ended 3-2 to Dortmund as an away victory. On 22nd April 2012, Batshuayi was shown the red card in a 3–2 loss at Genk for stamping on the chest of Jeroen Simaeys with the Royal Belgian Football Association suspending him for the next four games. On 25th September 2012, Batshuayi was again sent off in a 3–2 win at Mouscron in the sixth round of the Belgian cup, having elbowed Benjamin Delacourt within the first half-hour. This resulted in a 2 match ban in the competition and was fined €200. Michy Batshuayi made his first-team debut with the Belgian club Standard Liège in 2011. He featured in a total of 144 matches in his three and a half year stint at the club finding the net on 44 occasions. It was followed by a £4.5 million transfer to French team Marseille. The 2 seasons that he was a part of was eventful as he played in 78 matches and scored 33 goals. He snubbed Crystal Palace to move to fellow Premier League club Chelsea for £33.2 million to play alongside Brazilian playmaker Oscar. On 31st January 2018, Batshuayi joined Bundesliga club Borussia Dortmund on loan for the rest of the season.